The Jungle starts with an ending. Another eviction notice has been served in the Calais Refugee camp and the news has sent the place into a whirlwind of frenzied commotion. The inhabitants dash and scurry around as they attempt to secure their fate, filling the air with a slew of different languages and a feeling of chaos. The final act of this true story is well documented; the camp is bulldozed and tens of thousands of refugees are again displaced. 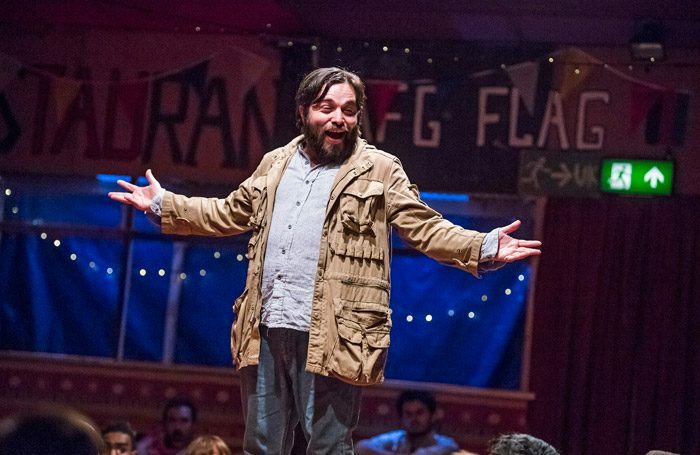 Joe Robertson and Joe Murphy have weaved together the memoirs of those who lived in and volunteered at the Calais camp and brought them to the West End, following a sell-out run at the Young Vic Theatre in 2017. 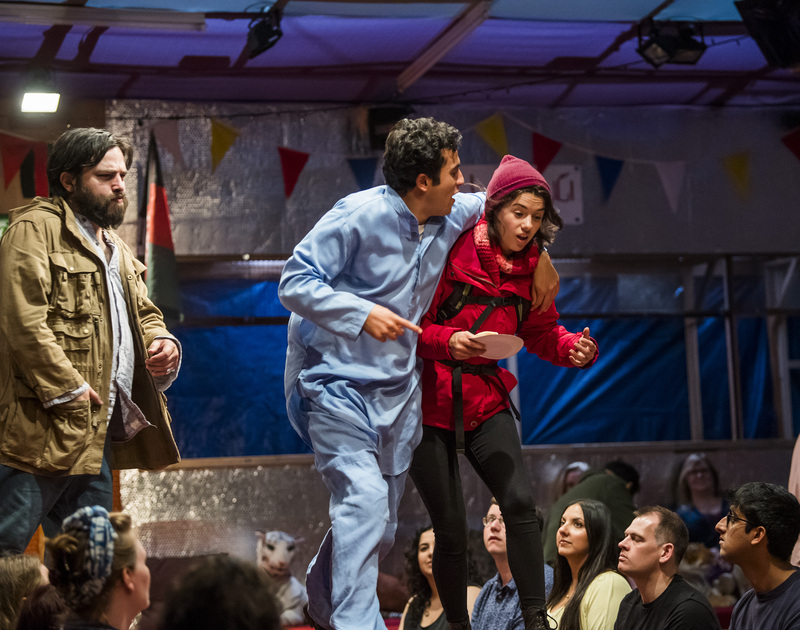 With the help of an eloquent narrator Safi (Ammar Haj Ahmad), we follow Norullah (Mohammad Amiri) and Okot (John Pfumojena) as they attempt to escape the past and reach the UK. The Playhouse has been transformed for the transfer. Miriam Buether’s set is Salar’s Afghan restaurant – once reviewed for the Sunday Times by the late AA Gill, the script notes. 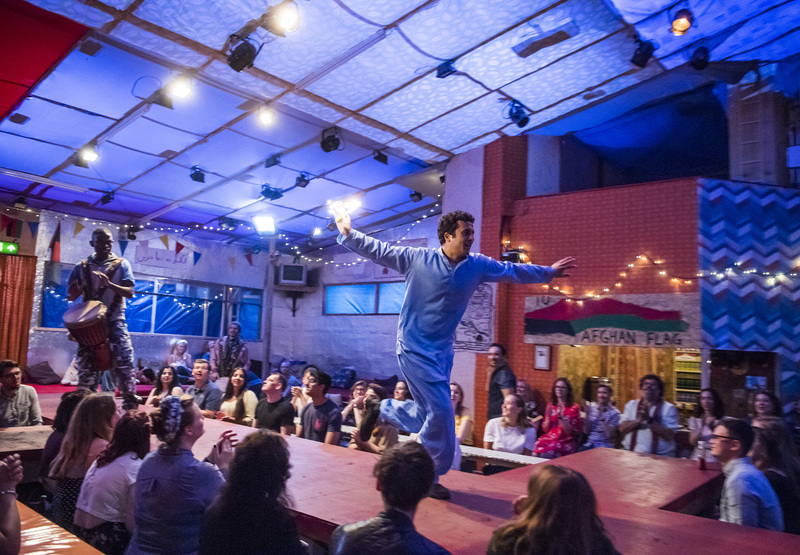 National flags, ethnic fabrics and fairy lights adorn the plywood walls. Hot stoves fill the air with the smell of freshly baked bread and the warm aroma of chai spices – cinnamon, cardamom, clove. Audience members sit around a thrust stage, disguised as a communal table. Underfoot is dirt, mud and bark. The music is the beating heart of the show. John Pfumojena’s compositions unite audience and actors through mellifluous harmonies. 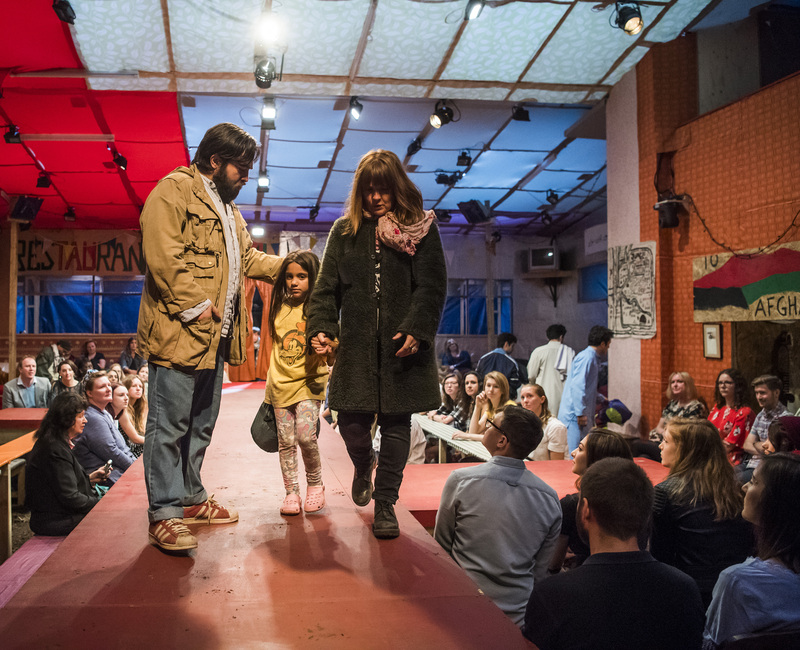 The Jungle features stellar performances across the ensemble. Alex Lawther is convincing as 18-year-old Sam the insufferable Eton-educated millennial, come to bring order to the camp by building a complex housing system. His white saviour complex is played with a nervous arrogance – a good match for his clever and confident counterpart Beth (Rachel Redford), who is decidedly unimpressed by both his elite education and his Barbour jacket. Amiri’s Norullah is a revelation. His charm is irresistible as he bounds about with an exuberance so grand the space can barely contain him. He is magnificent. 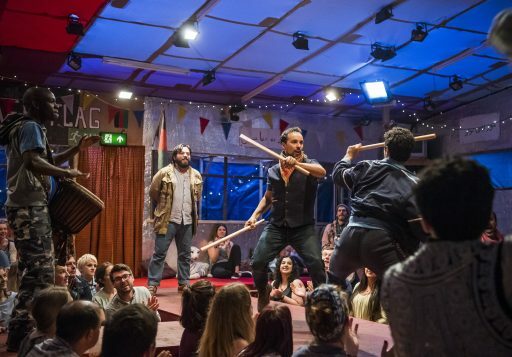 Stephen Daldry and Justin Martin’s production has taken on subtle changes since its Young Vic debut. An edited script makes for a clearer narrative that is expositional but not hackneyed. A group of additional actors creates a more convincing atmosphere. And the increased space contributes to a more compelling performance. The duo’s direction is stirring, with transitions from light to dark that are provocative. Their silences are profound. A transferred production rarely manages to achieve the same energy, the same magic as its original. The West End transfer of The Jungle not only matches the excellence of the Young Vic version, it raises the bar.